Food presentation is just as essential to the success of a dish as its taste. The way the dish appears on the plate is what attracts us and makes us want to eat it. It can either make or break a restaurant or diner, and it can turn a dinner party extravagant if done right. No matter how delicious a dish may look, if it is served on a dirty plate, you will definitely not be tempted to taste it. This is where the chef comes in. A dish’s appeal and presentability all depend on the chef’s mastery, and the chef must hit all senses—sight, smell, texture, and, most importantly, taste—to be considered a master. 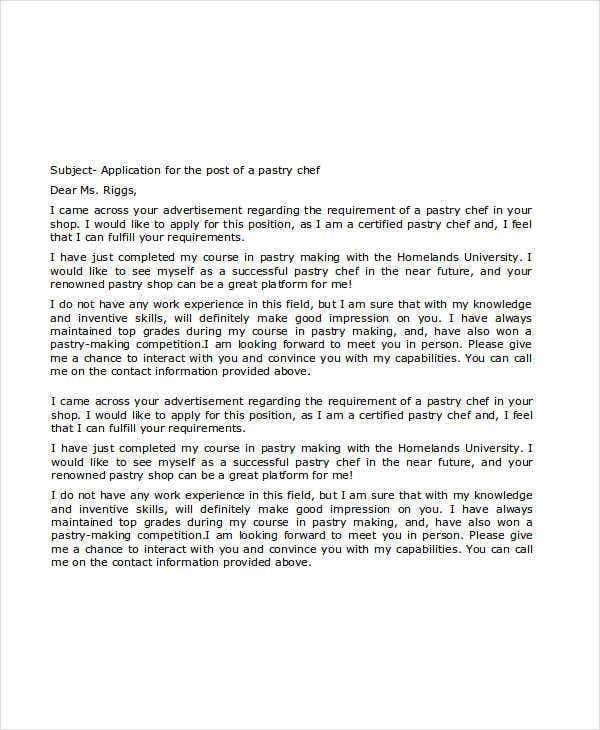 If you’re a budding pastry chef or a sous chef needing experience before eventually opening your own cafe or soon-to-be-Michelin-rated Haute cuisine restaurant, take a look at these chef Application Letter Templates. 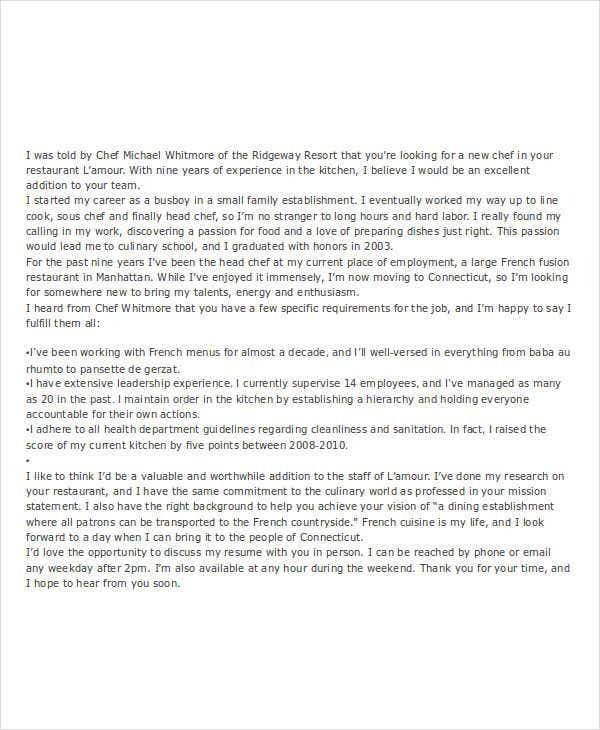 What Makes a Chef a Chef? A chef is not only a highly trained and skilled professional cook who is proficient in all aspects of food preparation of a specific cuisine; but, in some respects, is also an artist: he or she translates the lines, textures, and colors of every ingredient there is, combine them into a tapestry of flavor and different senses, and turn it into a painting that is a smiling woman, or a burping man, or a satisfied child. As complex as the chef may appear, all the great chefs have one thing in common: experience. And what better way to collect experience than being put through the furnace that is the kitchen and, most importantly, a school (for which he or she could write a Scholarship Application for a prestigious cooking academy). 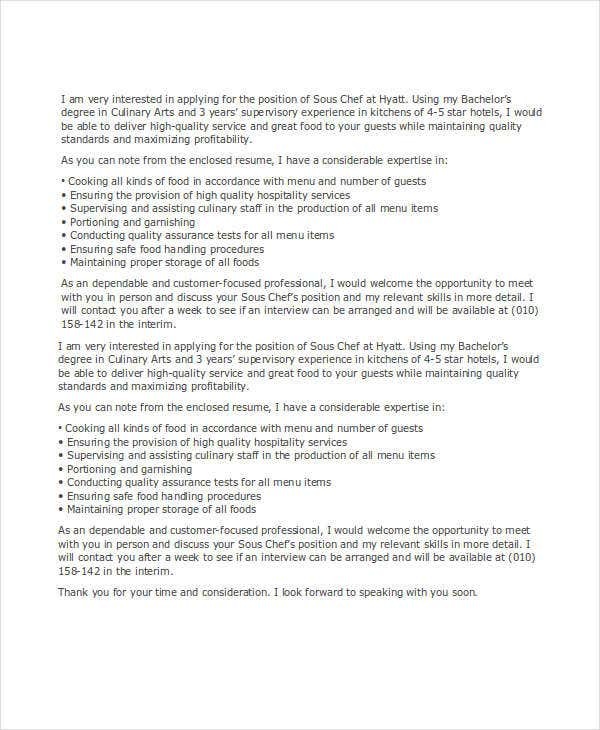 So You’re Writing an Application Letter for a Job as a Chef . . . The cover letter that you will send to your employer should not be a duplicate of your resume. It should present something that is relevant to the operations of the business especially on how your skills and experiences can add value to the company. 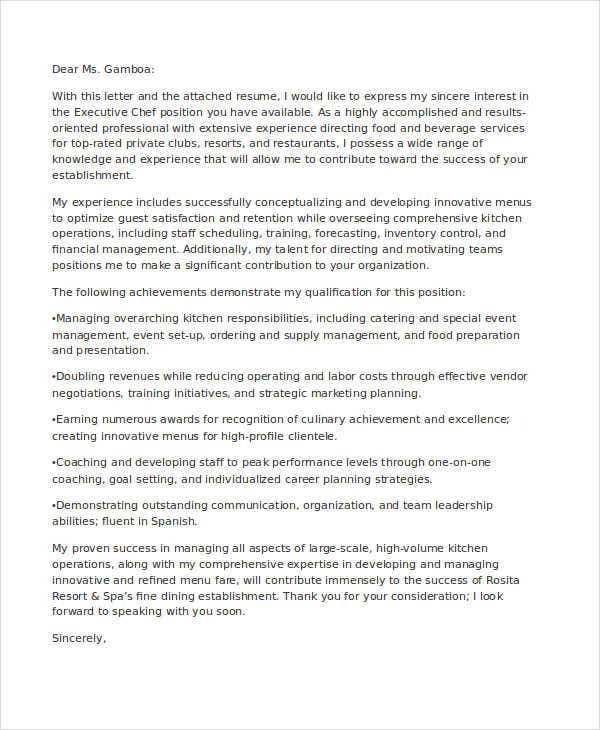 Moreover, your cover letter must specify the exact chef position that you are targeting to get. Support your professional aspiration by listing your qualifications, the environment of your previous work assignments, and the relevance of your technical skills and deliverable to the way that the kitchen of the business operates. If you want to be considered for an interview, you need to make sure that your cover letter is on point. Highlight the reasons why you should be hired. 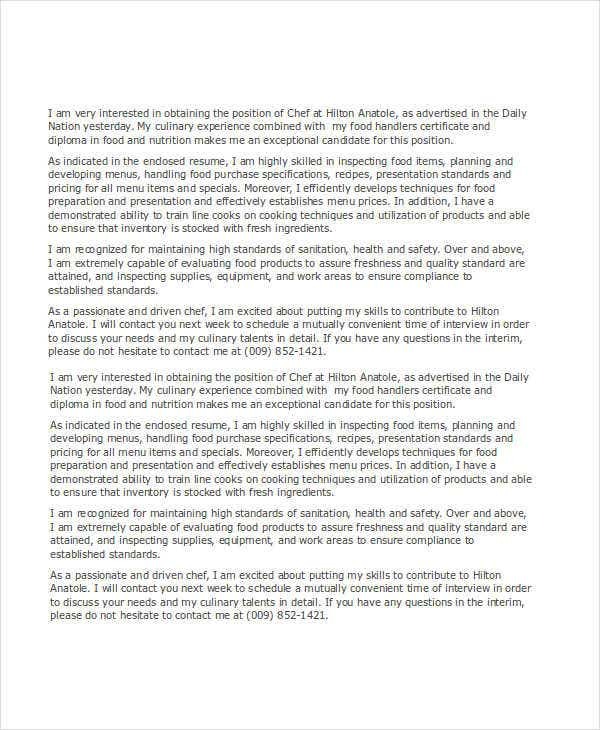 This is also the platform where you can give focus on your achievements in the field of culinary. Be more elaborate on the kind of kitchen operations that you are familiar with. If you think it would help, then add details of instances where your culinary abilities and technical skills have helped improve the menu or the kitchen flow of a business. 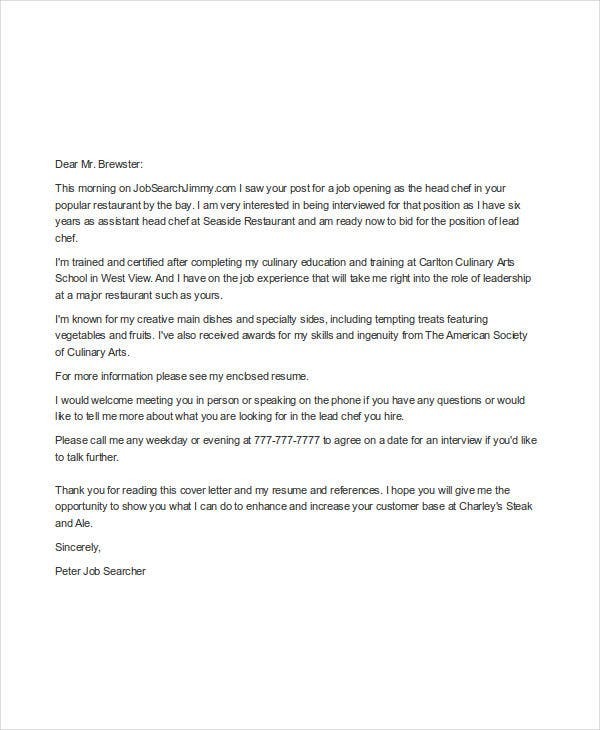 Start the first paragraph by introducing who you are and where you finished your culinary studies. Let the reader know how interested you are to work for their company and why you would be a good candidate for them. You may also mention here where you were able to obtain the information about the position’s vacancy. 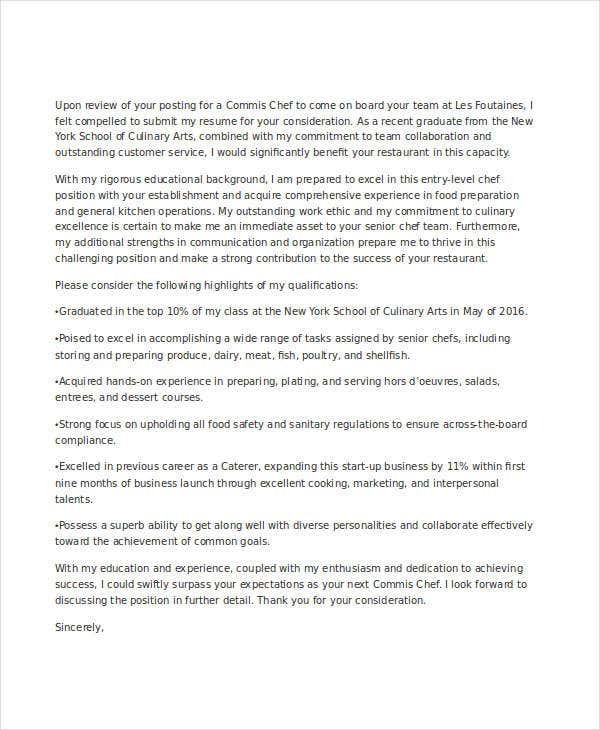 On the next paragraph or two, state your set of skills with handling and preparation of food and some other techniques that you learned during your time in culinary school and in your internship. This is where you try to convince the hiring manager that you are indeed the perfect candidate for the job. 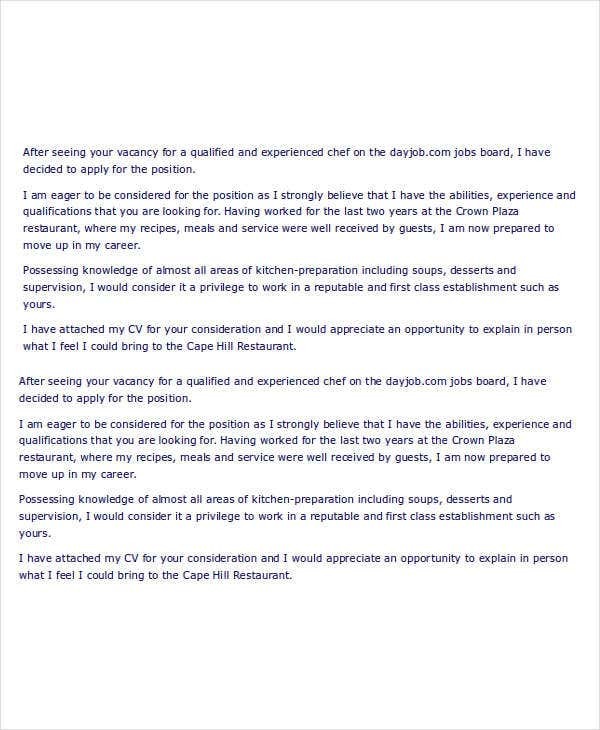 On the last paragraph, express your willingness to wait for their response and thank them for their time in reading your letter and resume. Write down your contact details for the hiring manager’s convenience should they decide to call you for an interview. Lastly, close the letter by addressing them appropriately and professionally and never forget to sign over your name. 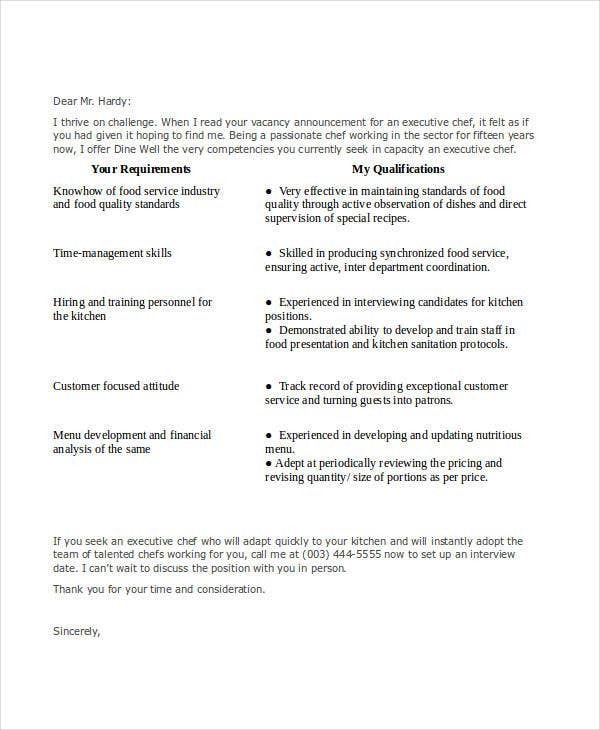 These templates were written by knowledgeable professionals who wish to provide you with templates that can assist you in writing your own cover letter. Downloading these templates is easy, and you can do it for free. You may also choose to save it in either Doc, Docx, or PDF, depending on which format works for you. These templates are fully editable as long as you have the needed software such as MS Office and Adobe Acrobat. 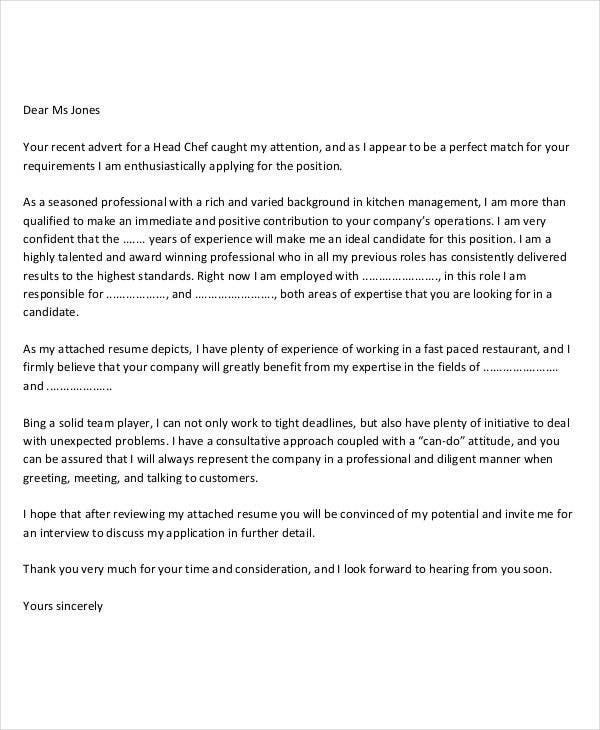 For even more templates, also check out our collection of Blank Job Application Templates.